You can view all of the graded assignments in your course using the COURSEWORK > INSPECT ASSIGNMENTS option on the navigation bar. If you encounter technical issues or have a question about your course, please see if your question may be answered on our Frequently Asked Questions page. Otherwise, feel free to contact us at support@connect4education.com. When you email us, your email is assigned a Ticket Number and is automatically tracked in our Web Help Desk. You will be automatically sent a copy of your email which serves as confirmation that we received your message. Please note that our responses always appear below your original email in a blue box. Simply reply back to the email you receive to update the Ticket with your response. It is extremely rare that an email you send us goes unanswered for longer than a day. Our busiest periods tend to coincide with the beginning and end of a semester. Please avoid waiting until the last minute to begin your coursework to ensure you are able to complete your tasks on time! All emails you send automatically generate a Ticket on our Web Help Desk website. 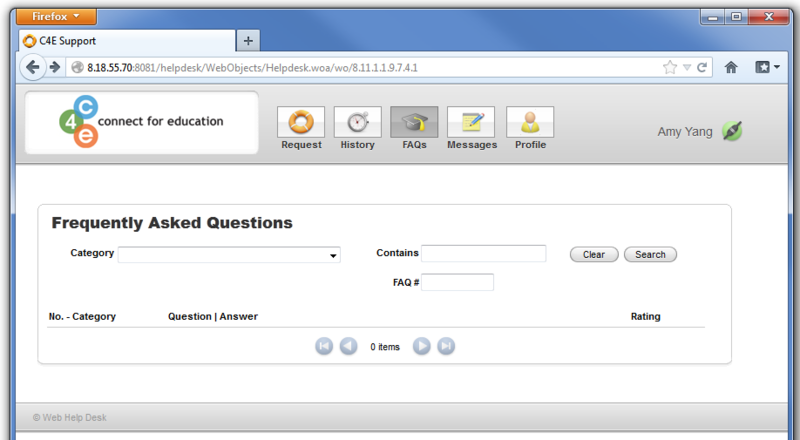 Logging into the Web Help Desk is not the same as logging into your course. A separate account must be used for Web Help Desk. If you've sent us an email, your username is your email address. You would simply click Forgot Password on the Web Help Desk login page to receive your password by email (You can change it later). 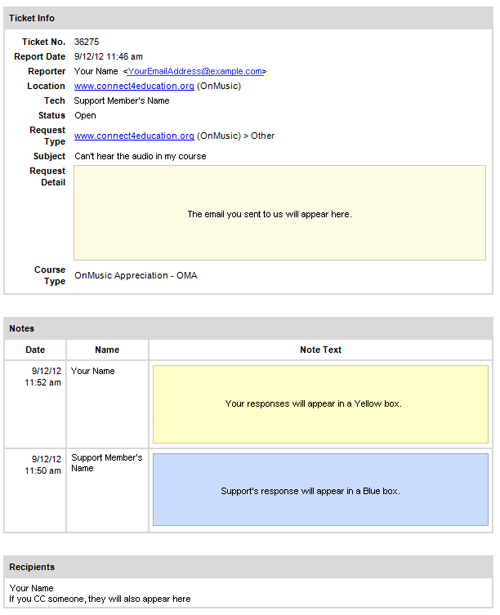 Please Note: A Web Help Desk account is not required. A Web Help Desk account is only necessary if you would like to access/manage your Tickets directly. If you choose not to create a Web Help Desk account, you can simply respond to the emails that are sent to you from the Web Help Desk system (i.e. when your email is received or when technical support updates your Ticket) and your Ticket will be updated automatically with the text from your email. Create a Ticket by clicking on Requests. Check the status of your Ticket by clicking History. Edit your Account information (update email and password) by clicking Profile. You can log out by clicking the Green Plug button in the upper-right corner of the page. You may also call Support at 703.880.1180 ext. 200. Support is available Monday through Friday, 9am to 6pm EST. Check what time is it where you live.